What a comeback! 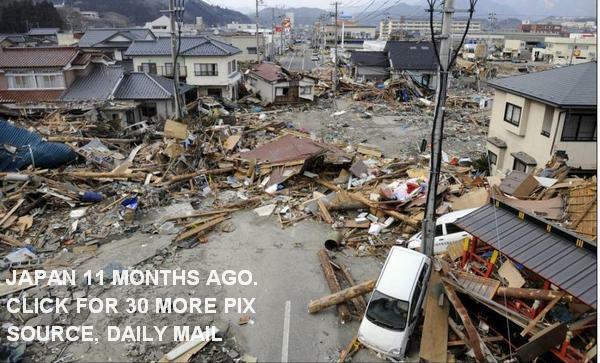 Eleven months after the tsunami . Take a look at this. And there’s about 30 more photos on the link. When Japan was hit by both an earthquake and tsunami in quick succession in March last year, the images of devastation gripped the world. And now after 11 months of tireless rebuilding, these pictures reveal the amazing progress made since those tragic events. Photographers returned to the scenes of desolation to take these stunning shots that capture the way in which the areas most severely affected have changed. Once upon a time there was an artist who worked with clay. He made cups. He made bowls. He made pitchers and bottles. He made little pots. He made big pots. 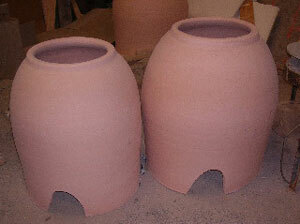 He really like making big pots, and he learned the secrets of making really big ones. In a perfect world his name would have been Harold, so I could call him Harry Potter, but alas, his name is Ron Levy. And he lives in New York City. So let’s set the scene. He’s an artist, so therefore at one point he was starving. That’s the narrative imperative; artist is to starving as jazz musician is to substance abuse problem. You can’t have one without the other. And I’m sure he was his mother’s heartbreak; she wanted him to go to medical school and become a doctor, but no, not him. He had to follow the American Dream, mk 1, which is to figure out how to get paid to do the stuff you like doing. And of course that barely worked. But unlike his soi-disant cousins portrayed in such sitcoms as Seinfeld and Friends, when Chance showed him the way to turn mud into gold he didn’t sit around and whine about it. No, he seized the brass ring through hard work and research, and achieved the best American Dream, the mk 2 model that defines the perfect job: it is now his job to cash the check and spend the money, while other people earn it for him. And now he can go back to making pots for fun, whether they sell or not. Ok, I’m embellishing like mad here, but that’s what makes a story a story. You need the setting, a bit of back story, and one of the three accepted forms of conflict. Then when you have that and add on the happy ending, plus lots of details and insightful comments, it becomes worth telling. The story exists on its own, never changing over time; it is our job only to fit the latest players to their parts and to spin the tale once again. RON LEVY never intended to become a tandoor mogul. In fact, he had never heard of tandoors — Indian clay cooking vessels that are part oven and part barbecue pit — until 1986, when a New York gallery exhibited six-foot pots he had made, inspired by amphorae on Crete. 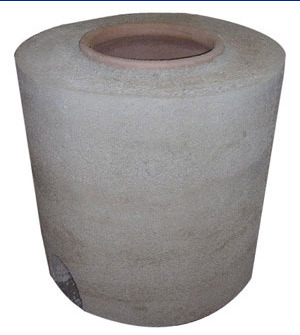 A man with an Indian accent called, wondering whether Mr. Levy, a ceramic artist, could make a large pot with a tapered mouth, no bottom and no glaze: a tandoor. After it was installed at a Columbus Avenue restaurant called Indian Oven, word spread through the Indian community, and orders began to pile up. “It came to the point where I had to stop doing my ceramic artwork, and focus on tandoors full time,” Mr. Levy, 63, recalled. The traditional tandoor that Mr. Levy set out to copy 30 years ago was typically an unfired vessel, the clay walls strengthened with straw and animal hair. “It was very unsanitary,” Mr. Levy said, adding that ovens shipped to the United States “often arrived from India broken, or would crack with extended use.” The tandoor’s shape, a cylinder with sloped clay walls, has remained essentially unchanged for 5,000 years. Mr. Levy’s first innovation was to fashion the body from a blend of earthenware and stoneware, the former chosen for its modeling and expansion properties, the latter for its ability to withstand high heat without cracking. For porosity (an essential quality so that flatbreads can cling to the oven’s inner walls), he added finely ground fired clay, known as grog. So he filled a market niche that had a pre-existing demand, and started making money, but he didn’t stop there. Keeping a great clay pot red hot takes a lot of heat, so he found a way to improve the ancient design by covering it up in fireproof insulation. For insulation and extra strength, he developed a clay and vermiculite mixture that could be baked onto the exterior of the pot. A unique cast-in-place light weight insulation is bonded to a 100% clay tandoor, pre-fired to 1,000 degrees C. This provides extraordinary strength, durability, and heat retention. 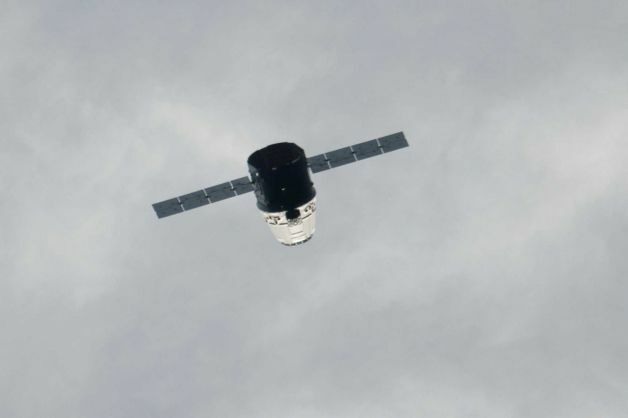 So it’s a better, stronger product that lasts longer and costs less to operate. Done yet? Time to rest on those laurels? Not hardly. Now he had to make it “professional”, and please those pesky government regulators at the FDA and come up with a version that could get NSF (National Science Foundation) approval, which is the stamp that everything used in a restaurant should have. Some say NSF stands for Nominal Sterilization Factor, because you only see this stamp on food related products that can survive a trip through the autoclave or a serious treatment with Clorox. 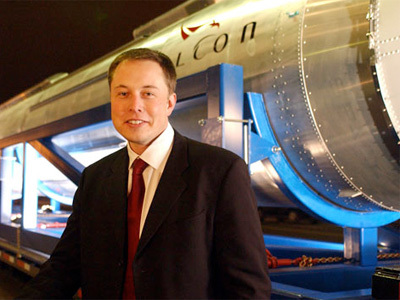 So he made that innovation as well, and the marketplace loves it. Finally, he devised a sturdy stainless steel housing, so the tandoor could be sold and installed as a movable, freestanding unit. Nice. The stainless steel model comes with wheels so it can be moved around in the commercial kitchen. It has even more insulation than the insulated clay model. And keeping it clean is a breeze. And to keep costs down and the EPA happy, you can get it with a gas burner instead of a charcoal burner. All Ron’s tandoors come in two sizes, regular and jumbo. It’s pretty easy to see how the stainless steel model is an upgrade put over the insulated model, which itself is an upgrade over the standard bare clay model. 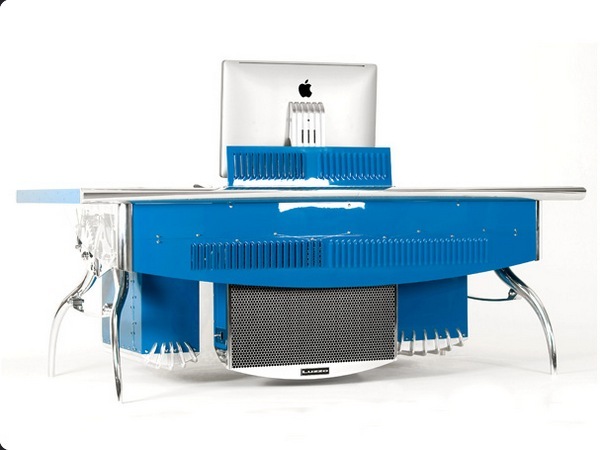 So the ultimate modern commercial tandoor is a double improvement over the traditional one. Hey, those laurels are starting to look mighty comfy. Is it time to have a seat yet? Hella no! There’s a whole new market segment to exploit! Now we’ve got all these Indian people coming over here, being a success, making lots of money, buying homes in suburbia and trying to assimilate as much as they can yet still hold dearly to tradition. Everybody else in the neighborhood has a backyard barbeque, but what a poor desi to do? 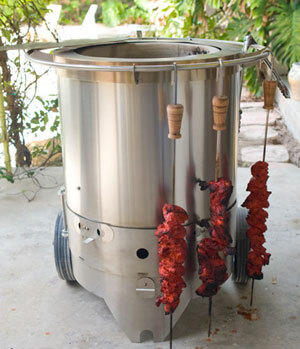 Now Mr. Levy has developed a tandoor for home use, the Homdoor. It starts at $1,200. The final challenge was production. Mr. Levy made his commercial tandoors in small batches as orders arrived. 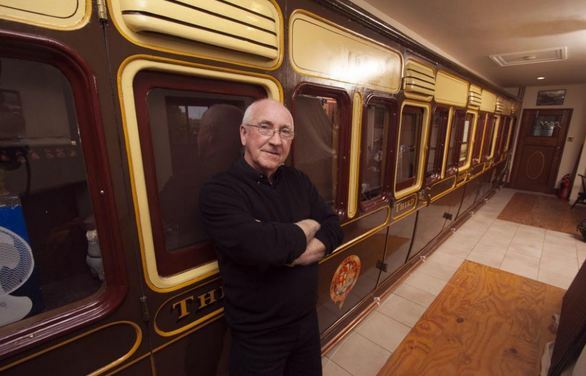 His business plan for the Homdoor, on the other hand, calls for 500 units to be built the first year. Last year, he joined forces with a ceramics company in Uhrichsville, Ohio. “It turns out, they were using the same press molds and virtually the same ceramic blend for their fireplace components and chimney flue liners that I use in my tandoors,” Mr. Levy said. Following Mr. Levy’s specifications, the company has built 50 Homdoors, tweaking the shape, propane burner and casing. 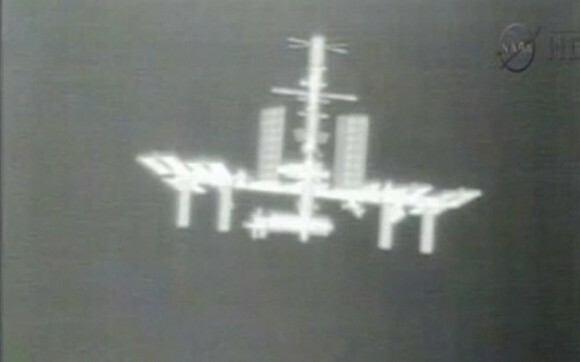 The first commercial unit rolled out in March. He was so pleased with the result that all of his tandoors are now made in Ohio. There ya go. Cash the check and spend the money. The perfect job. The American Dream, mk 2. And he lived happily ever after. Oh sure Drew, sure he did. Oh, you doubt me? How’s this then for the money quote, in our current rotten economy? Don’t you wish your business was forced to say something like this? Currently demand for Tandoors by Ron Levy is exceeding production. 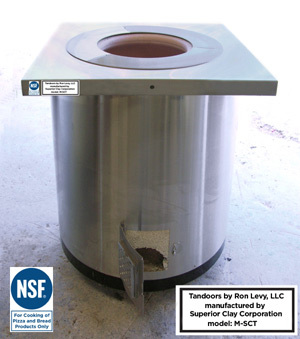 With the recent NSF Approval of Tandoors by Ron Levy demand is anticipated to further grow. In order to meet demand, Tandoors by Ron Levy, LLC are now being manufactured by Superior Clay Corp, Urichsville, Ohio. Will Superior Clay further improve the tandoors by lining the burner area with a refractory mortar coating like ITC 100? It would raise the efficiency somewhat, and Superior already makes a similar stuff called Heat Stop. Seems like natural progression to me. 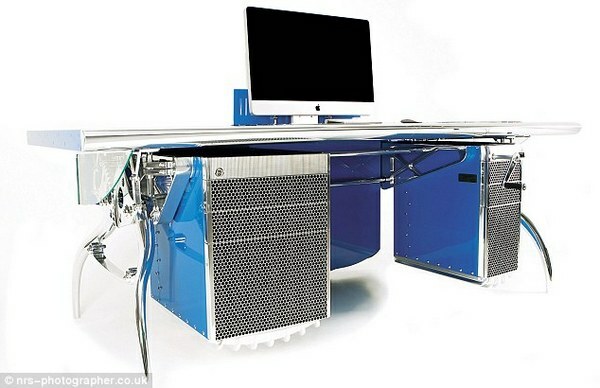 If somebody asked me to tweak the design, I’d think about adding a stainless steel grill down towards the bottom of the inside, to catch any naan bread or meat chunks that happen to fall in. And I’d add a little burner baffle above the gas ring that you could put some charcoal or wood on to add some smokey aroma for the gas fired models. Such things already exist for the food smoker market, so it’s really pretty easy to do. Did Ron Levy “stand on the shoulders of giants” (which is another way of saying “stole the whole thing from someone")? Hard to say, but I don’t think so. Call it parallel evolution perhaps. There is a company in the UK called The Clay Oven Company that has been making tandoors for about the same amount of time, perhaps a bit longer. They started business as a pizza oven company. 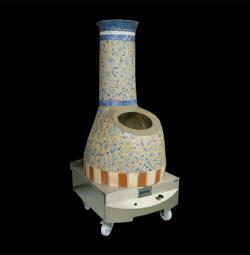 They make several stainless steel wrapped commercial models very similar to Ron’s top model, and they also make several mosaic tile covered models - one looks like a modified chiminea - for restaurants that have realized that part of the cooking is the show. But they don’t sell the raw ceramic tandoors, although they do have a homeowner size model. And perhaps they’ve only started importing to the USA recently, who can say? Besides, a little competition is a good thing, and leads to better products at better prices for the customer. And it’s not like the Indian cooking market is getting any smaller in either of these countries.